It’s been a little over a year now since I picked up Stetson from the Guide Dogs of America facility in Sylmar, CA. He was only 7 weeks old and weighed around 12 pounds. He looked to be one of the bigger puppies in his litter. There were 5 total puppies in his group one yellow Labrador Retriever and the other 4 were black labs. I can remember like it was yesterday. Louise, the puppy program manager was talking about our new puppies, going over the does and do nots of puppy raising, handing out our puppy starter kits, and finally walking down to the kennels for our first interaction with our new puppies! Bring a new toy and rub it on each puppy in the litter. This will get the scent of the litter on the toy. When you get home and it is time to “kennel” your puppy place the toy in the puppy’s crate. The scent of the litter on the toy will help put your puppy more at ease when it is time for him to sleep in his crate. For most puppies this is their first time separated from their litter mates and they will often times feel very lonely. You could also use a blanket instead of a toy or why not use a blanket and a toy. 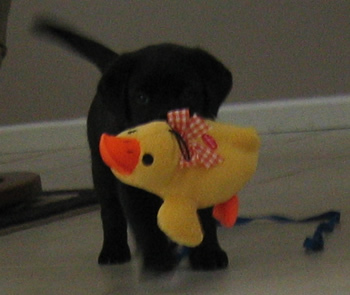 Below is a picture of Stetson with his first toy ducky (I got the scent of the rest of his litter on his toy ducky). If you are preparing to get a new puppy getting the scent of the litter is a great tip if you have access to the entire litter. It may just help your puppy and you get better sleep during those first few nights. What do you think of this training tip? Do you have any tips for new puppy owners? I would get a hot water bottle and put WARM water in it. Use a blanket that the pup is familiar with (may have smell of litter) to wrap the rubber bottle and place it in the crate. The warmness will be like cuddling up to the mommy and it will help the puppy sleep the first night away from the litter. @Peacedog, that sounds like a great idea. Have you tried that before? I’ll try that next time I raise a puppy. I might raise another guide dog puppy at the end of the year after Stetson goes in for his formal training. I have. I was worried that Leia would start chewing on the bottle, thats why I covered it. But she didn’t. Maybe she was too exhausted from all the running around with the kids. I only did it for a couple of days. My other suggestion: this is not tried and tested though, is to put a winding clock next to the crate. The tick-tock sound actually may relax a puppy as it reminds her of her mommy’s heartbeat when she snuggled up in the litter.